design — Writing… or Typing? Take Monday off and spend Monday evening at Woolwinders with Fiona Ellis, of course. She was as delightful this year as she was last year (and it was great fun to have her in a smaller group, outside the general melee of Stitches). This class was about Celtic knotwork patterns, a subject that has intrigued me since Marie made me a Starmore sweater (yes, I am a very lucky girl with delightful friends who are far too good to me). Truth be told, though, I think I would take a class from Fiona if she was teaching how to crochet a potholder. She’s just that fun, and I’m sure I would learn something intriguing about the history of potholders, because her mind is a heat-seeking missile when it comes to interesting stuff. So, of course, no photos (because I’m an idiot again and didn’t even bring the point-and-shoot that makes me crazy, let alone the SLR). 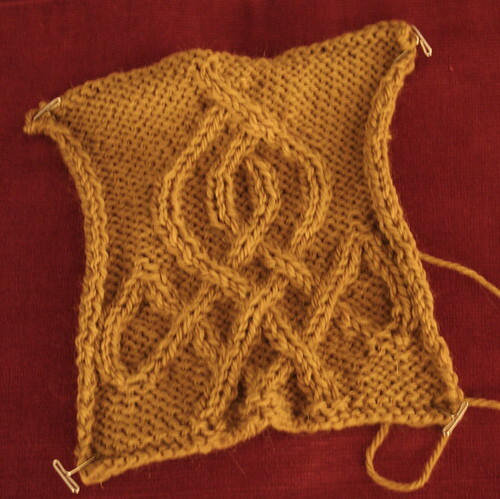 We did a swatch of a Celtic knotwork pattern and were encouraged to adapt it once we had the pattern set. Being me, I didn’t stray too far from the original design, but brought the two final cables together, seeking a sort of candle-flame effect (but we all agreed I’d really knit the Taj Mahal). And now I REALLY need to get back to reality. Ignore your own process (or lack thereof) and obsess over someone else’s perfect design. Seriously – does Hanne Falkenberg know she designed the world’s most perfect sweater jacket for me? The woman’s got my number. 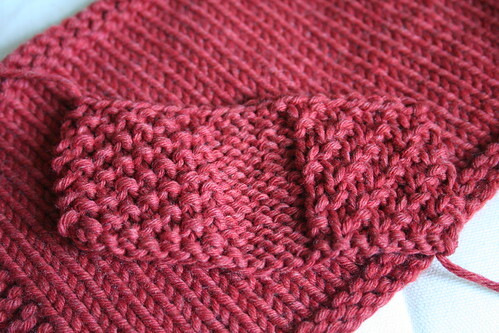 It’s a lovely colorway, so deceptively simple, structured yet easy, and….